Welcome to Pennyghael Stores & Post Office. 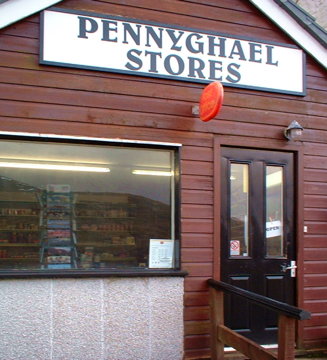 Pennyghael Stores & Post Office is situated on the A849 road to Iona, next to the Kinloch Hotel, overlooking Loch Beg. Call in for refreshments, snacks and groceries, postcards and gifts. Why not have a seat on the coffin rest and look out over the loch towards Ben More? If you are self catering or camping you can email ahead your grocery order and you can collect it from the store when you arrive on Mull. Toilets and ample parking available. E-mail Pennyghael Stores. Telephone us on 01681 704229. Book a tour with 'Wild About Mull' in store. Booking a tour with 'Wild About Mull' is very easy. Speak to Joy in the stores or e-mail us on this link or call Bryan Rains on 01681 704229 to discuss your requirements. Book a regular tour, or a bespoke tour just for you. During the spring months, in particular, we can be very busy. Please book early to avoid disappointment. View the 'Wild About Mull' website for more information or the blog for the latest sightings.